Makowiec – Poppy Seed Roll – Vegan Mofo 2017 Day 4 – vegan in your city. I never particularly liked poppyseed rolls also known as makowiec (MAK-oh-v’yetz) when I was a kid – from a distance, I’d see them and think they were chocolate, then get close and realize it was poppies. And then I’d be filled with sadness and maybe steal a bite of icing, but otherwise, sadness. For some reason, now that I’m both older and live in a Polish neighbourhood in Toronto I find myself wanting this damn cake every time I walk by one of the handful of deli’s along Roncesvalles. But I know these are not vegan, so I keep walking. About a year ago I bought a can of poppyseed cake filling, for the novelty, not even really planning on making a makowiec because I figured I’d never get around to it. Well, thank goodness it’s VeganMofo, because here we go. This recipe is based on a few things – my experience with challah, another egg heavy bread that I make with reasonable success without eggs, and a recipe in The Art of Polish Cooking by Alina Żerańska circa 1968. In a bowl or measuring up dissolve yeast in 1/2 cup of warm non-dairy milk. In a mixing bowl combine the flour, sugar, salt, and aquafaba. Back with your blend of yeast and non-dairy milk, add the rest of the milk and mix in the Earth balance or coconut oil. Mix until smooth (I used a stand mixer) – the dough should be dense and sticky. Prepare a clean greased bowl and throw your dough in. Cover it with a damp tea towel or loosely draped plastic wrap. Let stand in a warm place for approximately 2 hours or until it doubles in size. Once it doubles, punch it and put it on a flour covered surface. Divide it in half. That’s right, you’re going to have two rolls. Shape each piece into a large rectangle with a rolling pin and then lightly oil it. and spread around half of a can of poppyseed filling onto your rectangle. You could add a sprinkle of walnuts on this here, or skip it. Roll your rectangle up, seem side down, and turn the ends in to keep filling from spilling out. 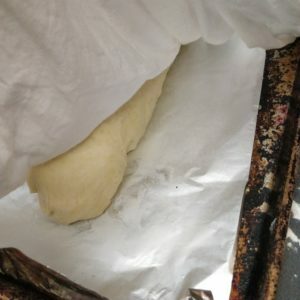 put the rolls on parchment, dull side of foil, a greased pan, silicon, your favourite baking stone, whatever, cover it, and let it rise up – it should double relatively quickly depending on how toasty your house is. Somewhere in here pre-heat oven to 175oC. Brush the top of your rolls with aquafaba and soy milk. Bake for 45-60 minutes or until your rolls are golden brown. Remove from oven and let them cool off. I made a simple icing with aquafaba, vanilla, cream of tartar, and icing sugar but you can also just dust with icing sugar. 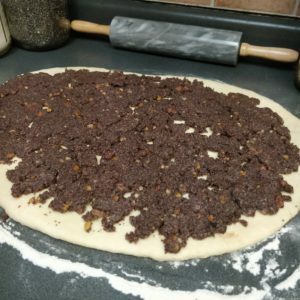 Hope you enjoy this recipe as much as I enjoyed making it. I think it just might tug on my nostalgic tastebuds and heartstrings. 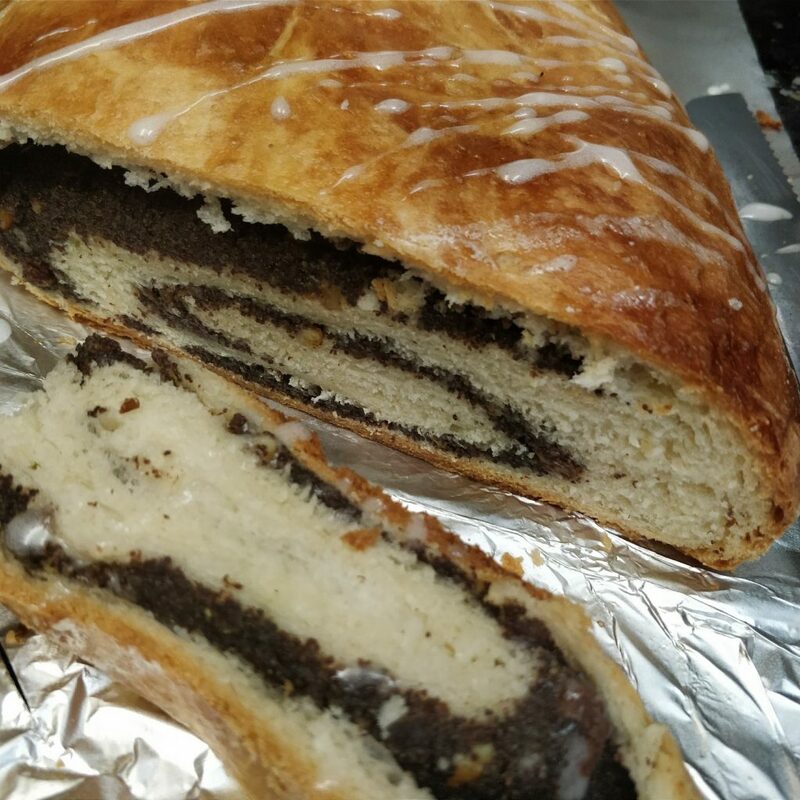 Ha, I live in the Czech Republic where they also love poppy seeds in their desserts and bakes, and I experience the poppy seed/chocolate dismay on an almost daily basis!